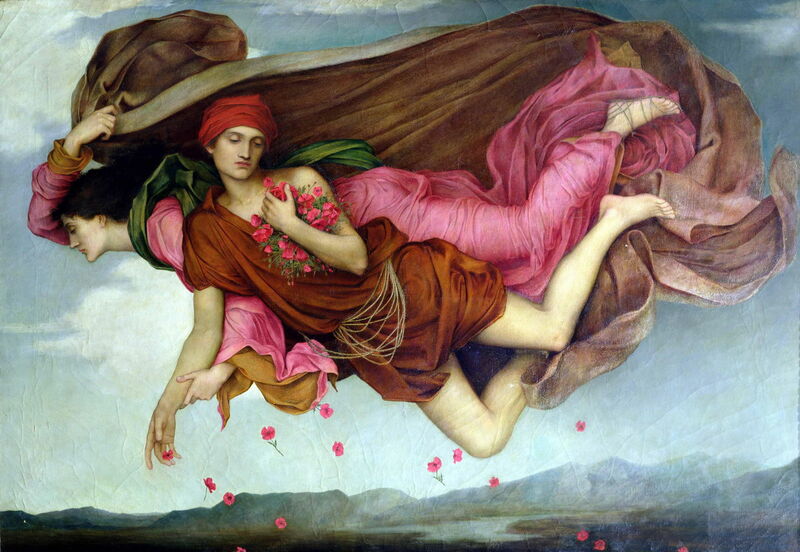 Evelyn De Morgan (1855–1919), Night and Sleep (1878), oil on canvas, 42 × 62 cm, The De Morgan Centre, Guildford, Surrey, England. Wikimedia Commons. 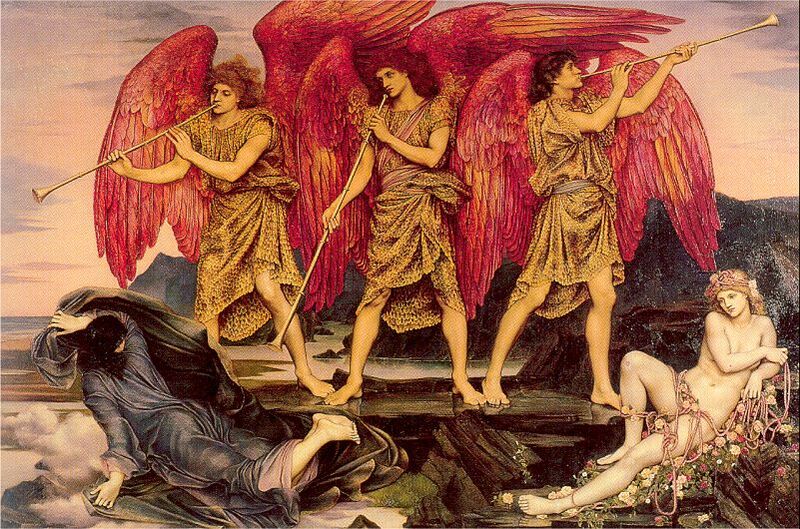 Of all the painters of the nineteenth century, Evelyn De Morgan (1855–1919) has to be one of the most fascinating. At first sight, her art is not that different, perhaps, from the many paintings in Pre-Raphaelite style. It might even look at bit of a dead-end compared to the far more exciting things that were happening in France. But it repays closer examination, and a better understanding of how it was made. In this article and the next, I will try to explain this, from a narrative view. Mary Evelyn Pickering was born into a wealthy upper-middle class family in London. Her father was friends with William Gladstone, who was to become Prime Minister, and she was introduced to art by her mother’s brother, Roddam Spencer-Stanhope, who was one of the first-generation Pre-Raphaelites. He introduced her to the Rossettis, Watts, Holman Hunt, and others. Her family saw her learning to draw and paint as an accomplishment expected of a well-educated woman, and she was very well educated – not only in arts, but in the classics and more. However she started to see this not as a set of social skills to aid her future marriage, but as a professional career. In 1872, at the age of only 17, she started to attend the newly-formed South Kensington National Art Training School (now the Royal College of Art) in London. But she quickly gained a place at the Slade, starting there in January 1873. Her style developed rapidly during her time studying there, until she left in 1876. Although the dates are not clear, she started to visit Italy in 1875, and at one stage travelled alone to Rome, Perugia, and Assisi. She also stayed with her uncle, Roddam Spencer-Stanhope, in his newly-purchased villa near Florence, where she visited the Uffizi and fell in love with the work of Botticelli. She sold her first painting in 1875, and the following year her painting Catherine of Alexandria was shown in the Dudley Gallery, London. She set up her studio in Chelsea, London, in the early 1880s, and in 1887 married the ceramicist William De Morgan. His work was largely inspired by eastern imagery, which came to influence hers too. Her husband’s father was a professor of mathematics at University College London, and close friends with many of the leading intellectuals, include critic John Ruskin, philosopher JS Mill, Lady Byron, and the social reformer Elizabeth Fry. Her husband’s parents were also ardent campaigners for new educational establishments, and instrumental in the foundation of Queen’s and Bedford Colleges for women. From the time of their marriage, the De Morgans were spiritualists. Although this may appear odd today, many Victorian intellectuals were fascinated by such matters. The couple practised automatic writing in the form of a long-running empirical quasi-scientific experiment, publishing a book on their experiences. Evelyn De Morgan was also a strong feminist, and a signatory to the 1889 Declaration in Favour of Women’s Suffrage. Like many other women artists of the time, she boycotted the Royal Academy, exhibiting instead at the Grosvenor, Dudley, and New Galleries, in London. The couple were also pacifists, and expressed their horror at wars in South Africa (The Boer War), and particularly the First World War. William De Morgan died in 1917, Evelyn in 1919. Her paintings have been associated with those of Edward Burne-Jones, who was quite critical of them, and Walter Crane, as a second-generation Pre-Raphaelite. However others claim them as being Symbolist, and they are also attributed to the Arts and Crafts Movement. Judge for yourself. 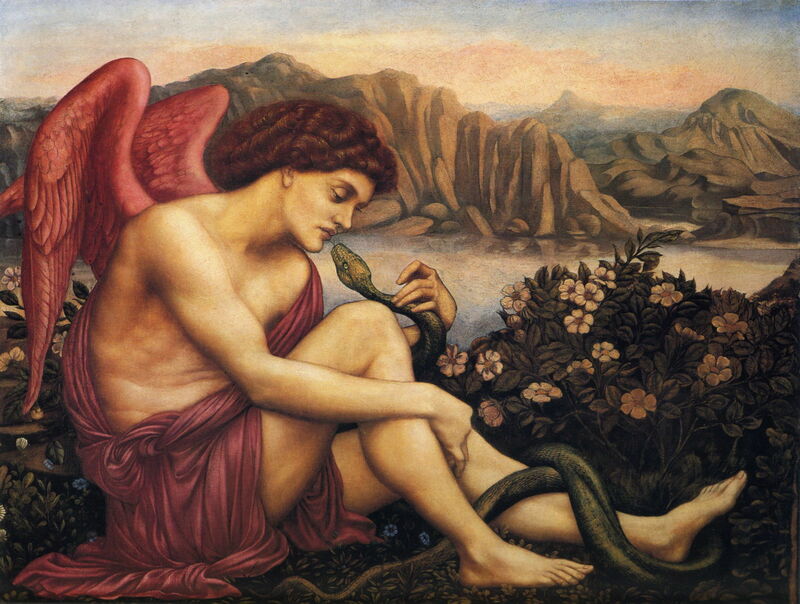 Evelyn De Morgan (1855–1919), The Angel with the Serpent (c 1870-75), oil on canvas, 89.5 × 112.4 cm, Private collection. Wikimedia Commons. De Morgan’s paintings are rich with angels, and this must be one of her earliest and most enigmatic winged creatures. An androgynous angel with rose red wings sits, right knee drawn up by his right arm, his left hand caressing a long green snake, whose tongue flickers out at the angel’s lips. Behind them is a low bank of dog roses (Rosa canina), and some low speedwells (Veronica spp.). This overlooks a broad river, with rugged rocks and a distant volcanic cone. I have been unable to find any textual reference which might explain this painting, and therefore can only take it as an expression of a clearly delicate relationship between the forces of good (the angel) and those of evil (the serpent). Painted mainly during her training at the Slade, it gives a good idea of her skill, and her influence by Pre-Raphaelites and by Botticelli. Evelyn De Morgan (1855–1919), Aurora Triumphans, or Dawn (c 1876), oil on canvas, 120 x 170 cm, Russell-Cotes Art Gallery and Museum, Bournemouth, England. Wikimedia Commons. The Roman goddess of the dawn, Aurora, reclines at the lower right, the shackles of the night shown as roped roses. At the lower left, Night is flying away in her dark robes. Above them, three winged angels resplendent in their golden tunics sound the fanfare bringing day. Aurora is triumphant in dispelling Night. The two key figures in this simple narrative are placed in static positions as if in a tableau, as was common in Pre-Raphaelite narrative painting. De Morgan transforms this with the addition of the angels, which dominate the scene and almost add sound. This painting also has an interesting history. First exhibited at the Grosvenor Gallery in London, it seems to have gone into a private collection until coming onto the market in about 1922. At that time, De Morgan’s signature had been overpainted with that of Burne-Jones. It was on the strength of that that it was purchased for the Russell-Cotes Museum in Bournemouth, where it now is, unveiled as one of Evelyn De Morgan’s paintings instead. Two figures fly through the air, from right to left. The further figure is a young woman (probably) wearing long red robes, her eyes closed, clutching a large brown cloak with her right hand. That cloak floats above the couple. Her left arm is intertwined with the right arm of what is probably a young man, who wears shorter brown robes. He also has his eyes closed. He clutches a large bunch of poppies to his chest with his left arm, while his right scatters them, so that they fall to the ground below. her slumb’rous poppies mixed with honey-dew. Spargens umida mella soporiferumque papaver is conventionally translated as “scattering moist honey and sleep-inducing poppy”, and describes well the effects of the opiate drugs derived from opium poppies, which were popular – and readily obtainable – at the time. 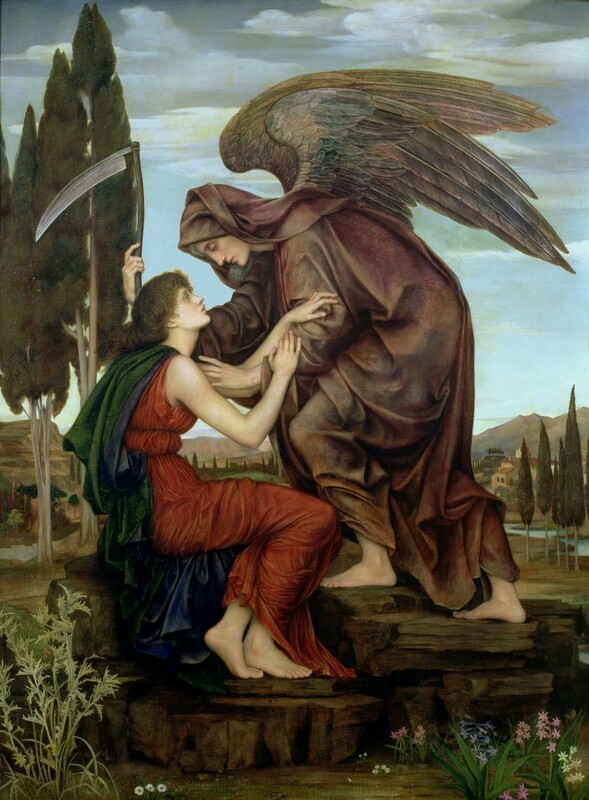 Evelyn De Morgan (1855–1919), The Angel of Death (I) (1880), oil on canvas, 123.8 x 93.3 cm, The De Morgan Centre, Guildford, Surrey, England. Wikimedia Commons. One of three similar paintings made by De Morgan, this shows the androgynous angel of death, holding in their right hand the scythe so feared by us all, comforting a seated young woman. The landscape at the left of the painting appears dry and barren, with just three daisy flowers visible. That to the right of the angel is better watered, more fertile, and has richer flowers. This has been interpreted as indicating that the woman’s past was tough, but that her imminent death will offer her a better future. Although this painting is not set in the same winter, it expresses the same spiritualist view that death is to be welcomed, not feared. In the next article, I will examine a further eight of her narrative paintings, produced from 1881 onwards. De Morgan Foundation and Collection. Drawmer, LJ (2001) The impact of science and spiritualism on the works of Evelyn De Morgan 1870-1919, PhD thesis, Buckinghamshire New University. Available here. Posted in General, Painting and tagged angel, De Morgan, narrative, painting, Pre-Raphaelite, symbolism. Bookmark the permalink. I love that your blog so beautifully covers computers and art. In case anyone else is as slow to make these connections as I am: Lady Byron = Ada Lovelace’s mother, and Evelyn’s father-in-law Augustus De Morgan = one of Ada Lovelace’s tutors. Perhaps Ada got to meet the baby Evelyn. Thank you for your kind words. These aren’t always deliberate – in this case you have spotted relationships which I had not!